Here is yet another opportunity for you to amaze your family and in particular your nearest and dearest. 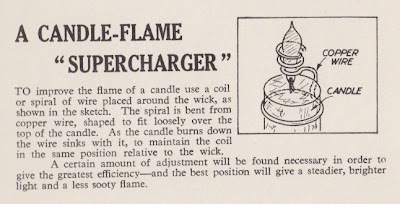 Your Christmas candle flames will be the envy of relatives and neighbours so just you get yourself down to the shed and start bending some wire and supercharge every Christmas candle in the house. 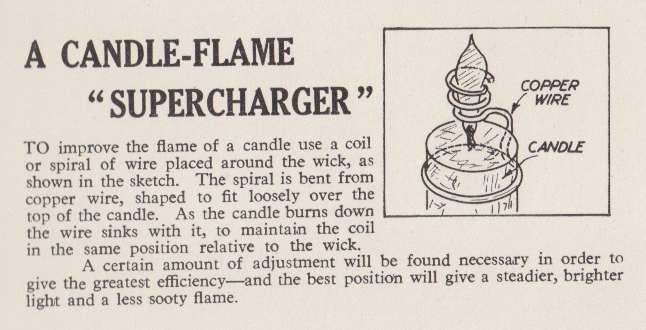 Remember, size really is everything, particularly when it comes to candles and candle flames. We all tend to over-indulge just a little during the holiday so if the Quality Street, Toblerone, Glace Fruits, cake, or chocolate yule logs start a tooth ache this remedy should help. Of course, over the festive period we all know that any dentist who is worth his salt will be holidaying in Mauritius, Australia, New Zealand, the Seychelles, the Carribean or some other exotic destination so this tip may be a life saver. Don't forget that the figs will also help to make space elsewhere for more system abuse too, now that really is a bonus.